The USI Electric MP117 Hardwired Photoelectric Smoke and Fire Alarm responds quickly to slow-smoldering fires to protect your family against deadly threats in the home. Perfect for new or replacement installations, the 120-volt AC hardwired alarm is suitable for houses, apartments and mobile homes. 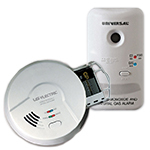 This smoke and fire alarm is fully interconnectable with all USI and Universal 120V alarms using existing wiring and mounting. 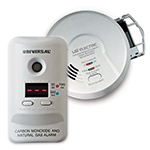 Quick Find alarm origination identifies the first detector to sound in an interconnected system and the single silence/test button temporarily quiets nonemergency alarms. This photoelectric alarm has additional automatic features including a self-diagnostics check to ensure proper operation, a sensitivity adjustment and an end-of-service life warning that sounds when it's time to replace the battery. The 9-volt battery (included) provides continuous protection in the event of a power outage. This USI Hardwired Photoelectric Smoke and Fire Alarm features a quick activation pull-tab and a front-loading battery drawer for replacement without removing the alarm from the bracket. Mount the bracket to any standard wiring junction box and use the large mounting base to cover imperfections in drywall. The plastic dust cover protects the alarm from debris and (2) tamper-resistant locks prevent unwanted alarm or battery removal. For maximum protection, install an alarm inside every bedroom, outside every sleeping area and on all levels of the dwelling. 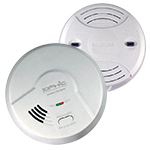 The USI Electric MP117 Hardwired Photoelectric Smoke and Fire Alarm comes with a 10 year limited warranty. Working fine. Easy to replace the old one. We purchased our home about five years ago, it was built in 2007. We have some very high ceilings and the house came with eight ASI Electric Hardwired Photoelectric Smoke & Fire Alarms w/Battery Backup. We were replacing batteries but were still having problems with beeping and the alarm going off.. We decided to replace some units and were unsure of replacement units that we could find locally. We went online to Universal Security Instruments Store and found exactly what we needed at about half the price found locally. We easily ordered online, received free shipping and delivery within a week. Easy to install and working well. Met my needs as anticipated. Easy to install. Relief to know my family is protected. Smoke alarm worked great. Installed easy and quick. Bought this smoke alarm to replace an older model. It took less than 5 minutes to change out. Happy with unit and ease of installation.